When my father returned from World War II, he started fishing again. It took a year to recover from a battle wound, but old black-and-white family photos show him back alongside the waters again, fishing rod in hand. My father would take me on many of these trips, and I caught my first fish, a brown trout, with a little help from him, from a wild place called Bear Swamp Creek in upstate New York in 1949. I was 4 years old. When I was older, I learned the story behind that awful scar on his arm. My father told me that he was on Iwo Jima when a land mine went off. He remembered the noise but not much else, until he woke up aboard a hospital ship offshore. Of his medals, he would say little, and his war stories sounded more like laconic anecdotes from a misspent youth. 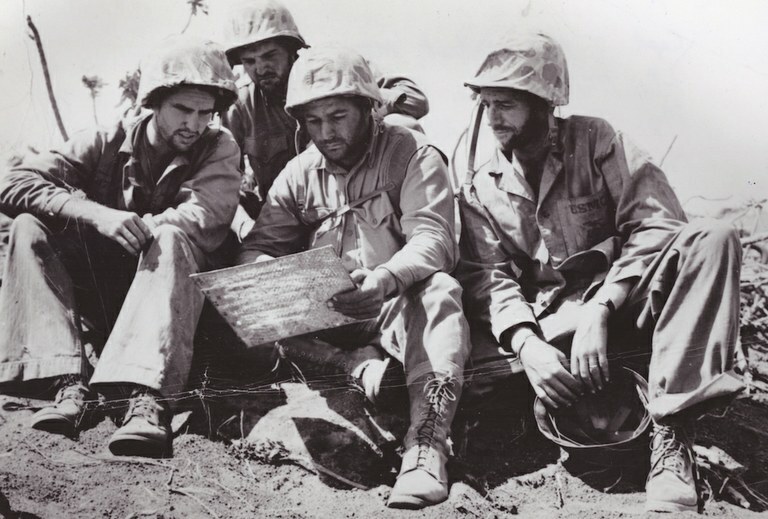 The author's father, Major John P. Salmon, U.S. Marine Corps, seated right, holding his helmet in Iwo Jima, Japan, in February, 1945. That scar was a visible sign of the deeper wounds that he would never talk about. It stretched from wrist to elbow, but multiple skin grafts and penicillin helped him recover fully, at least from the physical effects of war. When he picked up a fly rod, that scarred limb flung the line to soft landings on distant waters. I could only look and wonder. My father was still a young man, not yet 50 years old, when he passed away. I was in college. It was another sort of battle wound — gunshot, self-inflicted — that got him. He was living with fears no one could see. Though there had been dark troubles with drink, he’d whipped that disease before. He couldn’t whip this one, though. And so on Dec. 13, 1966, just before Christmas, he descended to the basement at an early hour and just checked out. Nobody saw it coming. And I can tell you that you do not ever recover from something like that. You don’t get over it, but you can get through it. I did so eventually, with the help of fishing. About a dozen years ago, my cousin handed me a dented aluminum rod case. Inside, wrapped in cloth, was a bamboo fly rod, an 8-foot three-piece with an extra tip, a tradition with bamboo rods. I could make out my father’s name, written in his own distinctive hand, on the cloth. My cousin’s father, my uncle, had borrowed the rod, and still had it when my father died. Now my cousin was returning it to me, with several woolly buggers he’d tied on for the occasion. With my father’s pole in hand, I took my first interest in fishing with bamboo. Bamboo rods, I would learn, are made by hand. The finest cane is grown in the Tonkin region of China, and it gives the rod a distinguished strength and flexibility. Fishing with his bamboo rod has helped me feel closer to my father. Though trout are the traditional game of the fly fisher, his favorite fish was the smallmouth bass. “Inch for inch and pound for pound,” he’d say, quoting the old lore, “the gamest fish that swims.” The species is not native to New Mexico, but I find it wonderful that it is here now, in certain remote waters of the Gila Wilderness. One of these remote waters is the middle fork of the Gila River. Arriving back home with my new rod, I cast one of my cousin’s wooly buggers there. Bamboo rods have their own rhythm — generally a slower, more deliberate casting motion compared to fiberglass or graphite is called for. It took me most of the morning to get the hang of my father’s rod, but by noon I had caught and released a dozen bass. That afternoon, I stood over the pool, looking down through its easy currents, before I realized how deep it was. The water was so clear, it looked like you could touch the bottom without getting your hand wet. I could see several large bass. Of course, that meant they could see me, too. I approached stealthily and cast from a distance. The black woolly bugger landed softly and drifted into the pool, then the bamboo arched with tension. The fish raced around the pool and jumped twice. But the bamboo was relentless and wore it down. Finally, I beached it, a bronze bass 16 inches long. I held it in the water, facing the current, until it revived, and I watched it swim away. My father truly understood the healing power of seeking wild fish in a wild stream. He fished a lot in his life — but, in the end, he didn’t fish enough. If he had, he might still be casting that cane rod — and I might be casting fishing with him. What’s left now is a son who was taught to fish wisely and to love it well, one Silver Star, two Bronze Stars, two Purple Hearts, and a legacy of bass and bamboo. M.H. Salmon writes and fishes from near Silver City, New Mexico.